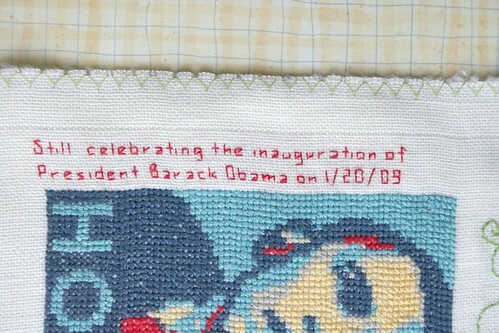 With the completion of the counted cross stitch Obama, the first panel of my band sampler is finished. Again, I hid my full name in the header for privacy’s sake. When I caught the embroidery bug late last year, I decided that I wanted to move beyond my early education of cross stitch, back stitch, and french knots. I found tutorials and stitch dictionaries online and became excited at the prospect of learning traditional embroidery stitches. I began to read up and found that old classic samplers (you know the ones — an alphabet, a bible quotation, a cross-stitched house with trees) once functioned as part of the education of young girls and women — to teach stitches. 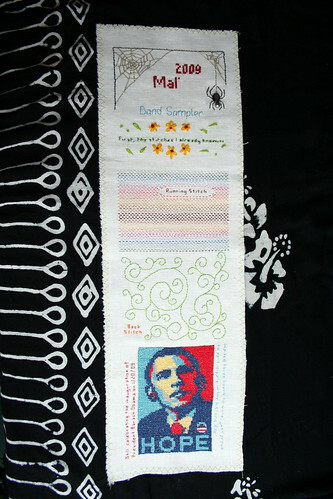 I figured that if I could learn about the standard form of traditional samplers, I could design my own mod sampler (like this one, by Mary Corbet) with the same purpose of learning. In my reading and research, I came across SharonB and Annie’s band sampler projects. 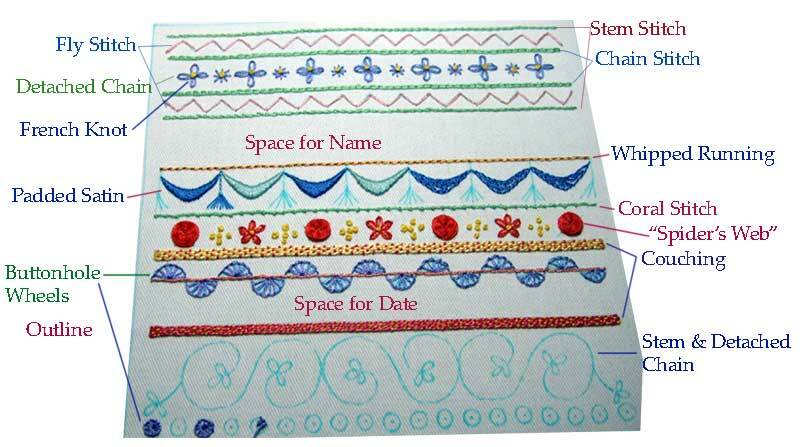 A band sampler (a long strip of fabric) was sometimes created by women who were learning stitches. It could be rolled up and tucked into a sewing box, where it would serve as a future reference. SharonB and Annie both include little biographical and current-events snippets in their samplers, and this thrilled me, given my long history of journaling (both written and visual). So, that’s how I got into the band sampler and, for me and my style of working and exploring things, it seems pretty perfect. It suits my rhythm of exploration and it satisfies my desire to document change and progress. All in all, I am really enjoying it. 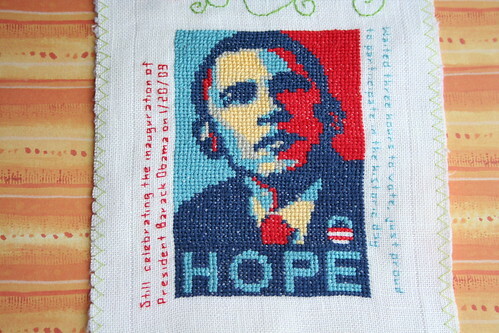 Especially now that I am done with that darn cross stitch. I mentioned before that I burned out on counted cross stitch when I was a teenager. However, at the beginning of my band sampler I wanted to document all of the stitches I already know. Naturally, this includes cross stitch. My aversion to it was so strong, however, that I had decided to count my name at the top of the sampler as my homage to counted cross stitch. 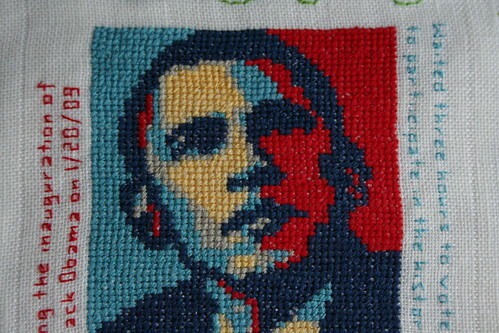 That is until I found out that Julie from Subversive Cross Stitch was offering a pattern of Shepard Fairy‘s iconic Obama poster for free. Because I’d like the band sampler to also function as a kind of visual journal, and because I was so moved and elated during the time of the election, I knew it would be a great inclusion. 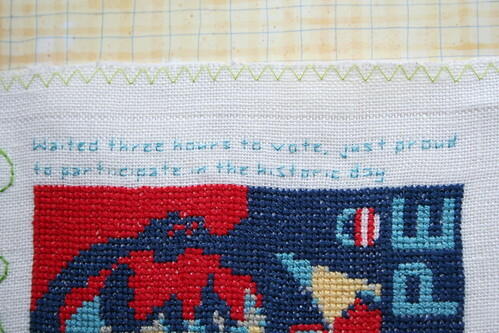 So, here is the counted cross stitch portion of my band sampler. I sped through this project, and there are lots of errors and missteps. But, it’s done and I can walk away from cross stitch again, for now. How about you? Do you have any media or projects that you dislike? Have you ever moved past dislike back to enjoyment? The march toward more handwork and less machinework continues. While collecting patchwork inspiration a few days ago, I was drawn (and who wouldn’t be!?) 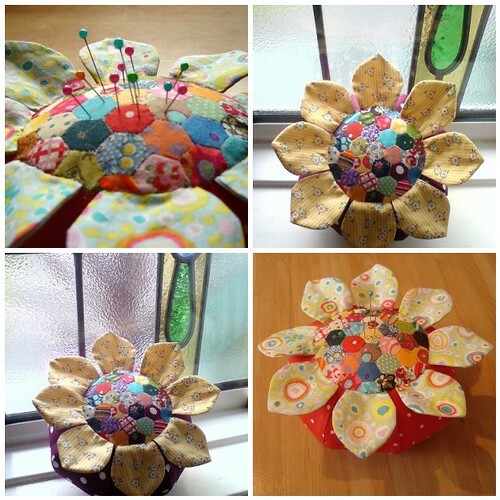 to this little pincushion made by duniris. It took my breath away and I have since stared at it for what seems like hours. 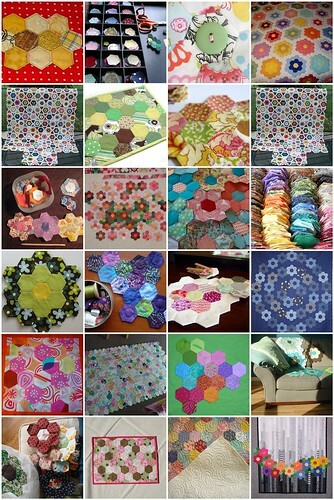 I have always enjoyed looking at hexagon patchwork, but never got too far beyond lamely wondering how it was done. Well, it turns out that the only good way is by hand — cutting, piecing, and stitching them together with needle and thread. Well, then there was no stopping me. Look at all the delicious hexagon inspiration to be had. What about you? Have you ever done hexagons or other hand quilting?